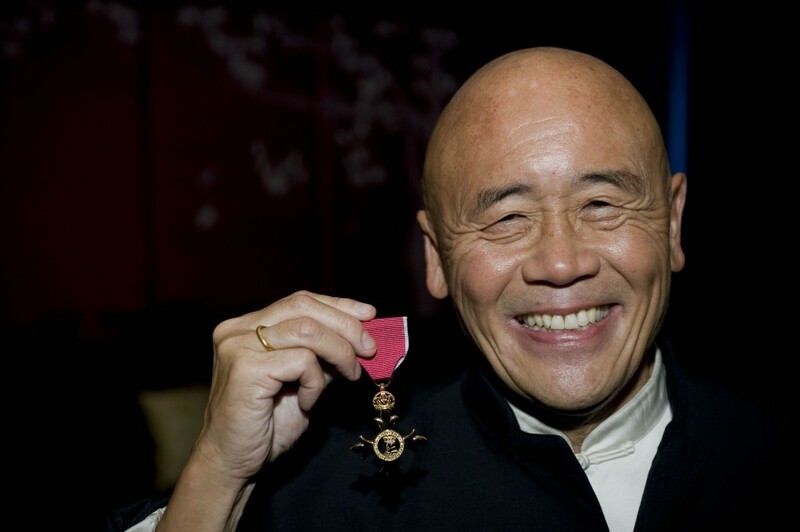 Celebrity chef Ken Hom, widely regarded as one the world’s greatest authorities on oriental cooking, has been awarded with an honorary OBE for ‘services to culinary arts’. The OBE (Order of the British Empire) recognizes his achievements and the impressive social and historical impact he has made on the way the UK has ‘adopted’ Chinese cuisine, which has now become one of the nation’s favourites. As well as being awarded with an OBE, 2009 also marks his 60th birthday and the 25th anniversary of his first television appearance on BBC, Ken Hom’s Chinese Cookery, the show which bore the same name of the book still regarded by many as the ‘bible’, reprinted this year in its anniversary edition. A most notable chef with a captivating television presence, Ken Hom has excelled at reaching a wide UK public who had limited appreciation of conventional cooking, let alone attempting to understand Oriental cuisine, which required a cultural leap of faith. By encouraging people to experiment with food through his ‘Foolproof’ book series and television programmes, Ken demystified this cuisine, making it approachable and interesting. His appeal has defied demographics, attracting not just women and men to cooking the Oriental way, but children in schools too, promoting healthy Chinese recipes. His name is also firmly associated with the Wok – the curved pan and key utensil for all Chinese cooking. Over seven million Ken Hom Woks and accessories have been sold in 59 countries worldwide and in the UK alone the brand is the market leader with over 60 percent brand share. One in eight Britons owns a Ken Hom wok. On receiving the OBE, Ken Hom simply said: ‘I am honoured and humbled by this award’. He was born in Tucson, Arizona, where his Cantonese parents lived after emigrating to America in the 1930’s. Moving to Chicago, at the age of 11 he went to work in his uncle’s restaurant where he earned the equivalent of 30 pence per day. At 20 he headed off to California and started to give cookery lessons to fund his university fees. He soon started teaching at the California Culinary Academy (a school for professional chefs in San Francisco) and then travelled to France and Italy to explore gastronomy further. His first book on Chinese cookery techniques was published in 1981 to much acclaim and then the New York Times published a major profile on him. Ken still regards the book and the NY Times article as one of the turning points in his career.